Treepedia is an interactive website which allows users to view the location and size of their city’s trees, submit information to help tag them, and advocate for more trees in their area. The green canopy plays an important role in urban life, with trees helping to mitigate extreme temperatures, provide natural respite from traffic, noise, and congestion, and improve the quality of our urban environment. Despite this, the average citizen is often removed from the understanding and development of their environmental habitat. As many cities experience warming temperatures, increased storm frequency, and continued air pollution, the well-being of our urban trees has never been more important. We present here an index by which to compare cities against one another, encouraging local authorities and communities to take action to protect and promote the green canopy cover. 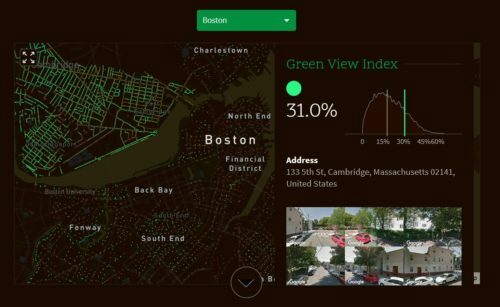 The project was developed by researchers at the MIT Senseable City Lab and in the development of Treepedia, it recognizes the role of green canopies in urban life, and asks how citizens can be more integral to the process of greening their neighborhoods. A publication explaining in detail the way this application has been developed can be found here. 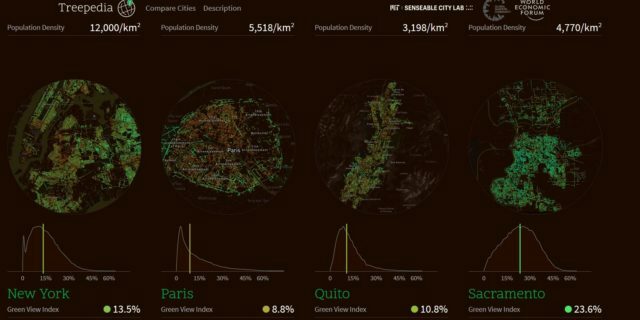 Treepedia provides an overview of the green canopy in 20 cities around the world. The user can either explore deeper a city’s Green View Index, or compare cities between them. In the first case, an interactive map is provided and the user can check the value of the index for any point of the city. These values are compared to the average value for the city and images from the Google Street View are provided as seen in the figure below.